Gordon Huether Studio is announcing their largest and most significant commission to date. Gordon Huether and his team have been selected to work with the Salt Lake City Department of Airports and architectural Firm HOK in meeting the goals of the Terminal Redevelopment Program at Salt Lake City International Airport, which includes a comprehensive art master plan. 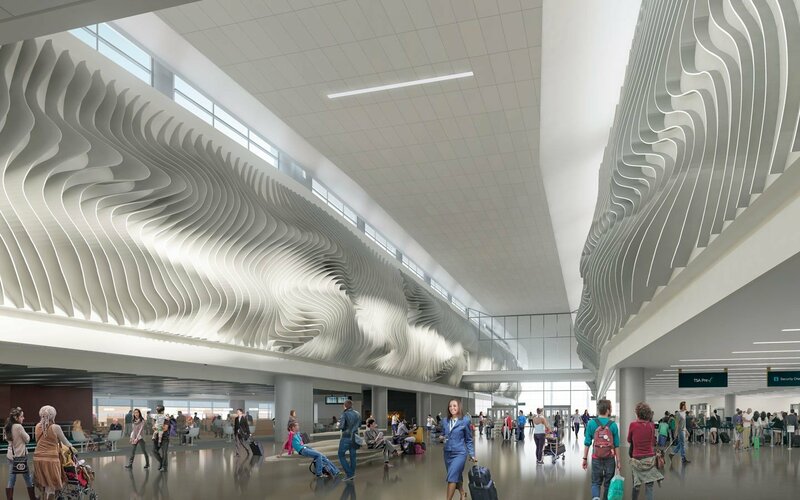 The brand new state-of-the-art terminal, currently one of the largest construction projects in the United States, will showcase Huether’s art throughout the new terminal. 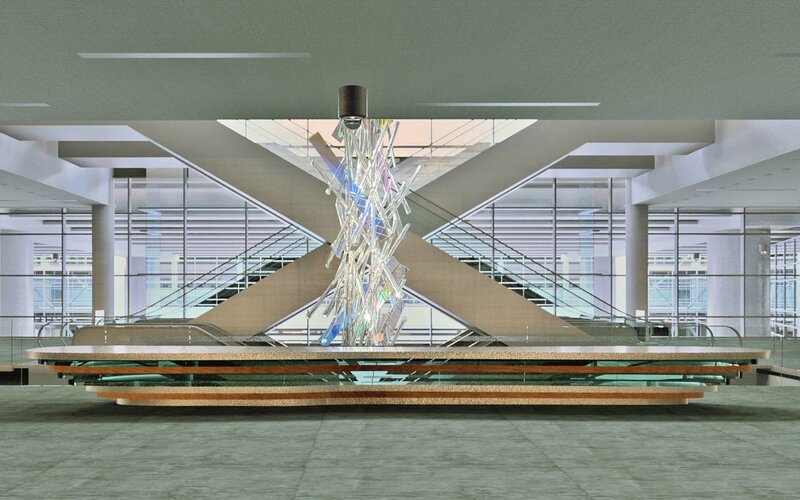 The artist’s largest art installation is entitled “The Canyon,” and will be integrated on both walls (east and west) of the new central airport terminal. “The Canyon” evokes the Salt Lake City landscape and spans 362 feet, the length of 1.2 football fields, using more than 2 acres of composite fabric, and the equivalent of eight miles of aluminum tubing. The entire work will consist of almost 800 individual “fins”. Huether will create a number of other structurally integrated art installations throughout the Terminal, all of which will be referencing the natural beauty of the landscape found in Utah. The Column Plates and an 80-foot tall escalator well sculpture are currently two other approved large-scale installations to be integrated into the building design. The sculptural Column Plates, located in a gathering area for both arriving and departing passengers, will be made of composite material and will create a visual distinction for the various activities taking place in the open space. The sculptural forms of the columns provide interest and induce a sense of wonder while maintaining their functionality and visibility of the view corridor. Benches made of a similar material and inspired by the column plates will be placed throughout the area. Gordon Huether has mastered the challenge of creating art in a multitude of environments and mediums. The scale of his work ranges from large architectural installations for public commissions to small intimate works of art for private collections and residences. Since founding Gordon Huether Studio in Napa, California in 1987, Huether has worked extensively with glass on a large scale and has also created works incorporating salvaged materials, bronze, aluminum, steel, light, fiberglass and composite materials. All work is fabricated at Gordon Huether Studio by artisans who are internationally recognized for their creativity, technical ability and craftsmanship. Huether’s talent for intuitively reacting to the materials and the space they occupy, whether indoors or out, has led to the successful completion of over 70 public art projects and more than 200 private art commissions. In 2009, Huether was the recipient of several awards, including the Americans for the Arts Public Art Network (PAN) Best Public Artwork in the US Award for the “Gotta Go” art installation at the Jacksonville International Airport. As a focal point of a high-traffic area, the 80-foot tall, suspended escalator-well sculpture makes use of the natural light provided by the curtain wall near the three-story escalator well, creating intriguing color effects in its vicinity. Colorful, light-sensitive dichroic glass fins are partnered with light refracting glass rods to create ever-changing colors and patterns on adjacent surfaces. Huether will also curate the Salt Lake City Department of Airport’s fine art collection, and assist in future public art opportunities. This collection includes a broad variety of local artwork to provide an additional ‘sense of place’ within the new airport structure. The Salt Lake City International Airport Terminal Redevelopment Program will completely rebuild the outdated passenger terminal complex and related facilities at the Salt Lake City International Airport. 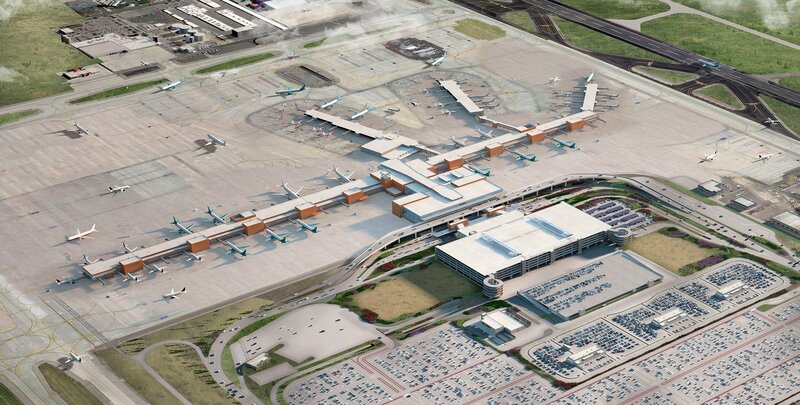 The effort will replace three aging terminals built 30- 50 years ago with one large, modern building with ample capacity for both the region’s local needs and the airport’s role as a major hub. The $1.8 billion project will be built in phases and is planned to be complete in 2023. The first phase that includes the consolidated terminal will open in 2020. The effort will create some 24,000 jobs and generate $1 billion in wages over the construction period. Salt Lake City Int’l airport serves more than 20 million passengers a year. Construction is being funded by several sources including federal grants, user fees, general airport revenue bonds, and airport reserves. No local tax dollars will be used.